Deciding which social media platform is the best for you or your business is like asking if cats make the best pet or dogs. The truth of the matter is that there are cat people and there are dog people. And, of course, there are dog and cat people who keep both animals as pet. Some people swear by Facebook as their social media of choice, and why shouldn’t they? It is the largest social media platform by a high number of users, after all. It allows more than 140 characters and you can create multiple pages without the need for unique email addresses for every page you build. Then there are those, such as the author of this post, who swear by Twitter. What is there not to like about Twitter? Its limit on the number of words you can use make posts snappy and to the point. The simple allows you to get your point across in an easy and straight forward manner. In addition, getting back to cats and dogs; you are not bombarded with cute pictures of fluffy kittens and cute puppies on Twitter as much as you are on Facebook. These reasons are what make Twitter the social media of choice for many, including a lot of small businesses. The author’s interest in Twitter leads him to write this post, which includes a list of top ten Herefordshire Twitter accounts based on the number of followers along with a much more interesting section about Herefordshire small businesses and personal Twitter accounts. The small businesses and personal Twitter accounts are considered more interesting because you actually get to know the people and characters behind the tweets, when compared with the top 10 Herefordshire Twitter accounts by traffic. These are accounts that mainly belong to larger companies such as Newsquest Media (owners of Hereford Times) and other media organisations such as Sunshine Radio. Here is a subjective list of the top 10 Herefordshire small business and personal Twitter accounts. Cathie Wilson, MD Sign Rite UK Ltd. Cathie has got to be the most influential Twitterati in Herefordshire. She tweets from her base in Leominster, from where she also runs her company, as well as Sign Rite UK Ltd, which specialises in signage for vans, events and other events that require professional signs. Cathie also runs the authoritative Herefordshire business Twitter networking hour #TweetHerefordshire. Cathie is a formidable tweeter user. She seems to run her Twitter account personally, without the use of Twitter tools that posts vaguely relevant contents to your account before posting some daft statistics saying how many people followed you this week and how many unfollowed you. She has even been known to respond to tweets when on holiday. Unlike some Herefordshire Twitter users, Cathies is not a clique. When you follow her, she follows you back if you are a Herefordshire based business or personal Twitter user. If you are not already following her, it is highly recommended that you do. Ben Roberts, Digital inclusion officer, Herefordshire housing. Ben’s day job is to help tenants of his employer, Herefordshire housing, who are not online yet, to get online and learn to take advantage of all the benefits the use of the internet can bring. Apart from helping newbies connect to the internet for the first time, he also helps to show them the important sites such as the relevant parts of Herefordshire council’s website, the Herefordshire library and, of course, how to use Twitter. In addition to being a Twitterati, he is also active on Facebook. Colita Dainton, L&D Manager Business Checkmate. Based in Abergaveniy, but mostly working in and around Herefordshire; Colita has an impressive 4.2K followers. She is bound to be one of the earliest Twitter adopters in Herefordshire. Her account was created in April of 2009, meaning she has been tweeting for more than 5 years. Georgia Hill rom-coms & historical fiction author. Being a writer, it is no surprise that author Georgia Hill has fired off more than 11,000 tweets since creating her Twitter account in April 2010. She does not tweet much about Herefordshire specifically. That may be because we only have her with us in Herefordshire in body while her mind is in Heart in Lyme Regis. She is, nonetheless, a Herefordshire Twitterati worth following if you are into rom-coms. Tan, who describes herself as mistress of money, tweets about family, pets and telly. She said her tweets are funny, random, and sometimes unfunny. She also admits to posting ranting tweets occasionally. Tan uses Twitter the way it was meant to be used; short burst of words that are straight to the point. She rarely posts images. Georgia Daisie, social media marketing professional. Georgia is a social media marketing professional. In addition to looking after the tweeter account of Hereford based digital solution company @V8MediaUK, she also tweets for a few other businesses. Georgia confesses to being easily distracted by beautiful designs & tea on her Twitter profile. Apart from being a fantastic Twitterati, she is also a very nice person. You can trust her with your Twitter marketing. Liz Hill, Rural Concierge. Tweeting as Rural Concierge and as herself @Lizi_is, Liz Hill tweets mostly about local businesses, days out, tourism and related activities in Herefordshire. 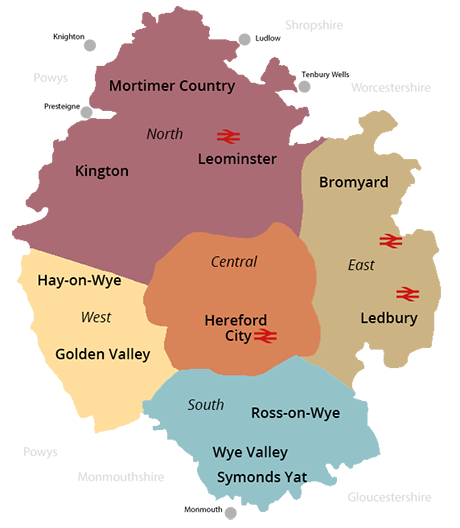 From her business base at the butter market in Hereford, Lizz Hill’s Rural concierge can help visitors to Herefordshire and residents alike plan or look for what to do or where to go for a great day out in Herefordshire. Kathryn Sassall, Artist. Kathryn’s paintings seem to love anything that moves, whether on wheels, pedals or hooves. Perhaps the faster the better because she seem to be a fan of F1 Le Mans. She is also one of the most altruistic tweeter users in Herefordshire. She not only follows you back when you follow her, but she also recommends that others follow you. Not a prolific tweeter at just 2,300 tweets since 2009, but she is a fantastic Twitterati worth following. Rocket Hereford Rocket Hereford. Rocket is probably one of the coolest cafés in Hereford. It has a strong sustainability credential in that it tends to use mostly local ingredients for its products. Rocket Café is also the venue for Rocket camp and it features the h.Energy menu during the h.Energy week. On Twitter, Ben, the chief Twitterati and owner of Rocket café, tends to tempt followers with lovely freshly made coffee and delicious looking cakes. If you don’t want to be tempted into going to rocket café waving a picture of delicious cake and demanding it; don’t follow rocket café Hereford on Twitter. Nicola Goodwin, triathlete & journalist. When Nicola is not doing her day job as a journalist with the BBC, she is a long distance runner, cyclist and adores open water swimming. She helps other triathletes improve their swimming, being one of the swimming coaches at Hereford Triathlon Club. Her tweets are mostly swimming and cycling related with occasional BBC H & Worcester retweets.